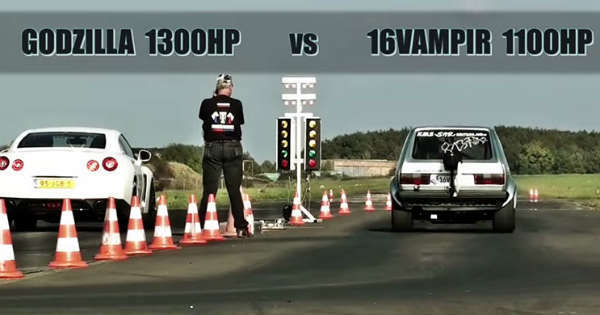 1100HP 16Vampir VW GOLF vs 1300HP Nissan GTR! - Muscle Cars Zone! 1100HP 16Vampir VW GOLF vs 1300HP Nissan GTR! To name one car Vampire you should have clear compulsions and evidence that it has strength, power and capacity to destroy its enemies like the mythical character does. The last ability in this case can be best shown during a drag race. 16Vampir VW Golf – now that is the full name of one of the main stars that you are about to see in this exciting drag race, where the opponent should not be underestimated at all, as it is a Dutter-Racing Audi 90 Quattro, a car that has great potential to overcome the power of the blood-seeker. Although this VW Golf has recorded a number of wins against prestigious and expensive cars, it should feel threatened by the capability of this Audi that has 150 more HP. 1100HP and 1250HP are the exact numbers that are associated with these two famous old models, which are ready to show their best. So what do you think who wins? Of course we do not want to spoil the surprise and neither should you, but all your comments about the drivers` skills and the car specs are more than welcomed. Check out this drag race now and have fun! Check out the web site of the BOBA Motoring Tuning Company here! And see more details about the 16Vampir VW GOLF.